Wow, I had forgotten how beautiful this picture was!!! 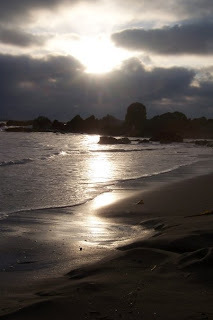 I took this in September 2008 when I went to see my dear friends Liesal and Jon in California. This is on the Newport Beach and I love love love it! What a fun trip that was! I should go back some time! Today is my sweet mom's birthday! I won't tell you how old she is, but you can know that next year is a big one for her! My cheesy parents at the Rain Forest in Puerto Rico last March. I love my mom and hope some day to be as great a mom to my kids as she has been to me! Some of you are really quick and noticed that the title of this post is the same as the title of my blog. Kudos for you! I just wanted to share that this year I have really been impressed to just take everything one day at a time, day by day. It's become my personal montra, "One day at a time." You see, for the first time in my life, I feel like I don't know exactly what this year is going to look like. I know, I know, the truth is, none of us knows. Anything can happen at any time, getting engaged, getting pregnant, moving, losing a loved one...sometimes life is unpredictable. But for the last 5 years, I had a plan, a vision, a goal I was moving towards. 5 years ago I graduated from Baylor and started working at Tallowood as the Preschool Associate. I had a 5 year plan. The plan was to get amazing experience, having a boss that had been at Tallowood over 30 years was a good start, and the other part of the plan was to get my seminary degree. In August of 2005 I started seminary. In August of 2009 I finished seminary! Along the way I receieved invaluable experience serving alongside amazing ministers and lay members. The 5 year plan has come to completion...now what? It had never occured to me that the problem with a 5 year plan is that it must come to an end...and then what? The amazing thing to me is that I'm not the only one asking myself this question. A LOT of people seem to be asking me this question. "Wow, you've been here 5 years, how much longer do you think you'll stay?" "Now that you have your seminary degree, aren't you ready to do something else?" And if you're thinking surely these people are people I'm really close to, think again. Two of the strangest inquirers are the Head Maintenance Guy and the Off Duty Police Leutinant at Tallowood. I mean, I know them both, and they are nice guys, but I wouldn't think they would even have another thought about my life after seminary. I would assume that they would assume that I would stay at my job forever (theoretically). I'll be honest, a little part of me is offended by so many people asking me this same type of question. I had no clue that with finishing seminary would come so much pressure about figuring out my new life plan! Here's the deal. I love my job. I love where God has me right now. I don't know what tomorrow holds, what this year holds, but I know who holds tomorrow. My life is in God's hands. I'll be honest, it's not always easy to trust Him fully. I wish it were. It's scary not knowing what the next year of my life looks like. But I know that I wouldn't have it any other way. He has a plan, and I'm grateful for that. I must simply wait. Wait on Him to guide my steps on the path He has set before me. For you see, the Psalmist says, He is a lamp unto my feet, unfortunately not a spotlight looking up ahead. One last thing, allow me to clarify. I'm not saying that my life is going to drastically change this year. Repeat: I love my job. All I'm saying is that for the first time in a long time, I don't have a 5 year plan and all I know to do is trust Him day by day as I seek out His will for my life. The truth is, it's a great place to be, a place that I hope never to grow out of. It's good to plan, I'm a planner, but it's better to be walking with Him, trusting Him to guide you in His light. Last night I went to a youth event at Tallowood called Xpress. I helped set up for it and was really excited to be able to go this year. I havn't been able to go in several years. Xpress is an opportunity for kids to use their talents that God blessed them with to express their love for Him. Some kids created art projects that were on display, several sang or played instruements, and even a few girls did a gymnastics/dance routine. The theme of the night was based on a ministry that a girl named Abby Tracey has to street boys in Kampala, Uganda. She is in her early 20s and is passionately in love with serving the Lord through ministry to these children who are the last and the least. They raised money for her last night and she shared a little bit about what life is like in Kampala. It is truely inspiring to see her live a life sold out for Christ in an unimaginable situation. Here's a link to her blog if you'd like to follow along. Jerome, Rebecca & Micah always do an amazing job of setting the scene. Here are some pictures from the night. When you first walked in, this was what you saw. The idea here is to show that God's creation is his expression of His own creativity. Every person that showed up had their picture taken here and then later in the night they had a video of all the pictures of us, God's creation, pretty cool concept. This pic isn't very good, but that's a picture of Abby with one of the boys, and a make shift fire that they might cook a meal over. This TV was playing Planet Earth, again, attributing to God's creativity through creation. Then, when you turned the corner there was this gallery of art that some students had created for the event. Then, when you entered the room, there was a series of signs with statistics about street children. Very powerful. Then, in the corner there was this shack, that represented what a street boy might live in. It really was a cool night. I've had a bit of writer's block, wanting to post, but everytime I open up this page, I don't know what to write. Well, that's not entirely true...I have tons to say, but I just can't say it right now...all in good time. How's that for a cliff hanger? So...in a desperate attempt to post more regularly, I'm going to start a new series. I'm going to browse through my old photos on my computer and "at random" choose a photo, hopefully one I've never posted on here, and then tell you what was going on, why I chose that pic, you know, some anecdote related to the photo. So I bring you the first installment of "remember when." I didn't take this picture, obviously, Abigail Criner did. 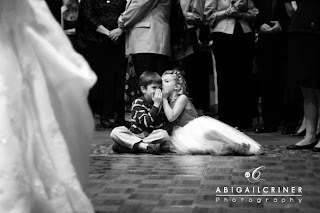 This is Ashlyn & Brady at my dear friends, Jeff & Erin's wedding over 2 years ago. I think it is beyond precious. Talk about a good photographer to catch such a percious moment. I've always meant to frame it, but never did. Sorry if this wasn't as exciting as I thought it was going to be...maybe it'll get better, but for now, atleast you got a post, right? Wowsers, I don't think I've ever gone that long without blogging before! I hope I still have some readers that come by to check in! Anywho, allow me to give you the reader's digest version of what I've been up to for the past 3 or so weeks. Thursday, Dec 24 - Kelly & Brandon arrive in Corpus, had a fun Christmas Eve going to my home church and spending time with people I grew up with! Friday, Dec 25 - CHRISTMAS DAY! Opened presents with my parents and Kelly & Brandon (round 2), lounged in our pjs all day and made yummy enchiladas! Monday Dec 28 - Wednesday, Dec 30 - hung out in Corpus with my parents, Kristy & her kids. Thursday, Dec 31 - my mom & I headed back to Houston to sleep through the New Year! Friday, Jan 1 & Saturday, Jan 2 - my mom & I did INTENSE deep cleaning of my apartment! It was amazing! Great cleaning out, and even some sprucing up! Good times! Monday, Jan 4 - Wednesday, Jan 6 - wonderful time with my preschool & children's minister friends! Hung out, shared ideas, laughed, (they) cried, cooked, sat by the fire, had deep and meaningful conversations...truly a wonderful and beneficial retreat! Thursday, Jan 7 - exhausted from the retreat, worthless at work. Went to see A Chorus Line off Broadway with Jamie. Friday, Jan 8 & Saturday, Jan 9 - did as little as possible!!!! Lounged, vegged, how else to I say it? My sweet friend Rebs came over and did nothing with me, which is always more fun!!! We both had had a crazy few weeks and just needed to recoup! I can honestly say, I woke up this morning, ready to go! So, now you know what I did over the holiday! I hope you are all doing well, and I promise, I will try to post more often!